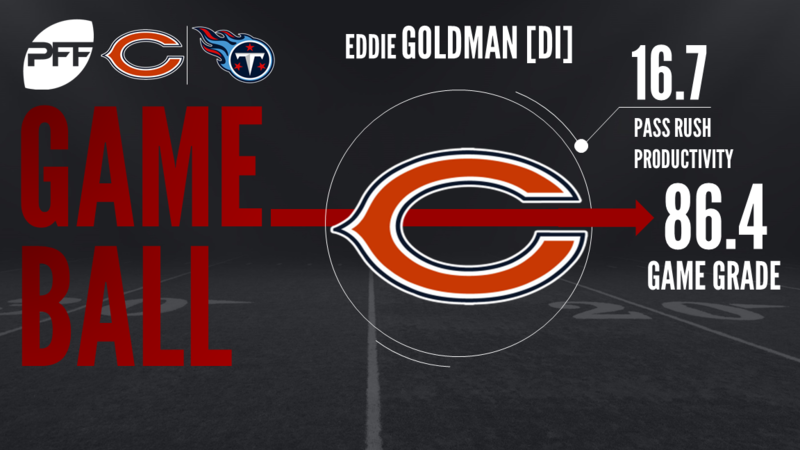 The Titans first-teamers played more than they probably thought they would in their Week 3 game against the Bears. Titans QB Marcus Mariota finished the game 12-of-21 passing for 193 yards, playing into the fourth quarter, where he tossed his lone touchdown of the game to RB Derrick Henry. Bears fans were treated to an impressive 96-yard opening drive by QB Mike Glennon and another solid performance by rookie, No. 2 overall pick QB Mitch Trubisky in the second half, as they came away victorious with the help of a Trubisky-Tanner Gentry 45-yard touchdown in the fourth quarter. With that, we give you our PFF exclusive takeaways from the contest for each team. On the one hand there were a couple of plays that left you wanting to see Trubisky in regular season action. His pin-point, in-stride heave down the left sideline to Tanner Gentry was a throw to raise the hopes of even the most cynical of Bears fans. It’s not the good that worries you, but rather the bad and there was some of that on show. He should have been intercepted after misreading the coverage and then he inexplicably fumbled a snap away to show that some more seasoning is ready before he is served up to face NFL defenses. Still an ecnouraging outing and progress being demonstrated by his desire to push the ball down field more. In his first two games that number was 27.3 percent, in this one it surged to 46.7 percent. With the horrible news that Cameron Meredith has potentially torn his ACL, the Bears are running their own scramble drill at receiver. Victor Cruz didn’t distinguish himself despite playing late into the game and there remains something of the unknown as to what they can expect from Kevin White. So it is then that former Titan Kendall Wright may be in the line for a bigger role. He certainly flashed an elusiveness and ability to get open in Tennessee that captivated the imagination, but has never consistently put it together. Playing with the first-team offense, he was a favorite target for Mike Glennon as he went to work on Adoree Jackson as he picked up 2.33 yards for every route that he ran. Now in his his sixth year in the league, the one time 1,000-yard receiver may not have a better chance to deliver on the talent that saw him drafting in the first round back in 2012. On the surface, the grade of Houston is incredibly encouraging. It’s a good day at the office when you can turn 24 pass-rushes into a sack, hit, hurry and forced fumble and nobody would say otherwise. But coming off a couple of torn ACLs, never being healthy enough to live up to his contract, and now owed no money on his deal, Houston is very much fighting for his future in the league and for a one-time highly sought after free agent, it was striking to see him on the field for the Bears’ last defensive snap. Whether this was a reminder of what he can do to the Bears’ staff or an audition elsewhere, Houston showed he still has some gas left in the tank. Jones isn’t the kind of guy you expect to be starting and it’s more likely that his biggest contributions come on special teams where he is trying to follow in the footsteps of a number of Bears in recent years. But it’s important that he can contribute in more than just the third phase if called upon and he put forward a solid effort today to remind the coaches of the depth he brings to the defense. He ended the day with two defensive stops (joint second highest on the team) while also converting two of his three pass-rushes into hurries. His history with the team and efforts in preseason should be enough to see over John Timu, who didn’t help his cause with two missed tackles today. There’s no doubt that Mariota is the guy in Tennessee, but if he plays like he did today during the regular season then not only will people start questioning that, but all the chatter of the Titans making a run at the postseason and beyond will die as quick as it begun. Throughout the game, Mariota had balls sail on receivers, especially when throwing outside the numbers where he was a woeful 1-of-8 on balls that went wide and beyond 10 yards. He did make some throws into tight windows but if you’re a Titans fan right now, you’re hoping this was more about getting the bad out of your system, then showing you’re ready for the season. This was meant to be the spot for Corey Davis to wow everyone with his first round talent. But with him injured, it has fallen to Taylor to get fans in Tennessee excited. Perhaps the most interesting things regarding Taylor aren’t his performance so much as his usage. He was a featured part of the offense, used split out and in the backfield as head coach Mike Mularkey seemed to indicate he knows he has a huge weapon on his hand and he is going to make sure he uses him. It was only on two of his 26 offensive snaps, but this marked the first time in preseason he has been used in the backfield. Welcome to the NFL. On the evidence of today’s game, Jackson’s best way of contributing as a rookie may be an as electric returner because he had real problems in coverage as the Mike Glennon-led Bears went after him relentlessly. The first drive was not something he’ll enjoy watching again and he ended the day giving up six catches on eight targets and getting flagged for a penalty. He did show character to stem the bleeding, and showed his willingness in the run game with a nicely played tackle for a loss. But Jackson was drafted to cover receivers with more pedigree than Kendall Wright, and on the evidence of a preseason that is seeing him play far more in the slot than he did in college, he’s not there yet. It’s remarkable that Klug is even on the field, less than nine months since tearing his Achilles. Indeed for an unheralded pass-rushing interior specialist, you had to wonder if we’d seen the best of him and if he would never get the credit for being the underrated pass-rusher that he is. But there he was out on the field and not just that he was making plays. Two hurries and a batted pass on 15 pass rushes, and some flashes of that quick get off that has caused offensive linemen fits over the years. At one stage, you wondered if he might make the team, now it’s more a case of how often he’ll get on the field when the season starts.